Mozambique is still an untouched country. After 20 years of civil war, tourism development has just started and in most places is still inexistent. From South Africa to Tanzania, over 2000 Km off amazing tropical coastline, unbelievable diving spots, dream-beaches, and fabulous African bush. The expedition takes you to the Save River, which starts from Zimbabwe, for a week on the river. 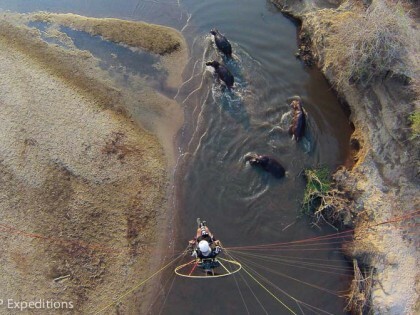 We will fly above unbelievable scenic landscape, hippos, crocs, and all kind of wildlife that abounds there. Starting from the huge concession of 650.000 Hectares that a good friend is running, we will canoe the river down to reach the ocean. The delta of the Save is amazingly beautiful, with lots of fishermen villages and pristine blue waters; and is the home of the last African Dugong, and we will try to find them from the sky. After a week of pure African experience of canoeing and camping in the bush, we will reach the delta where the expedition will end. We will then go to Bazaruto Island to spend 3 days in an amazing lodge and will fly over the fantastic sand dunes and blue waters, dive in the crystal clear ocean, or simply relax and enjoy the 5 star services of this exceptional place. Be one of the only people canoeing in the Save River, and fly over it!. 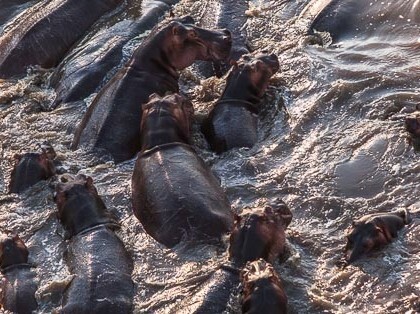 Observe the hippos and crocs, which abounds in the waters, from the shore, the canoe and the air. Experience a Canoe African Expedition from a river to an ocean! Fly over the magnificent Save Delta. Look for the last African Dugong from the air. 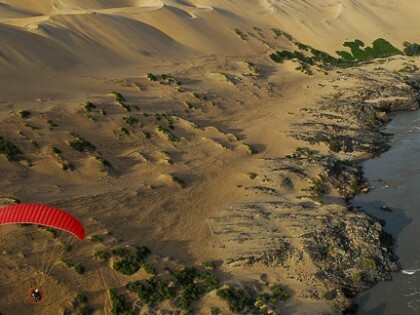 Fly above the amazing sand dunes of Bazaruto island. Dive and relax in Bazaruto Island, a real tropical heaven, as a conclusion of the trip. Arrival, transfer by road to the comfortable Camp, in the concession. 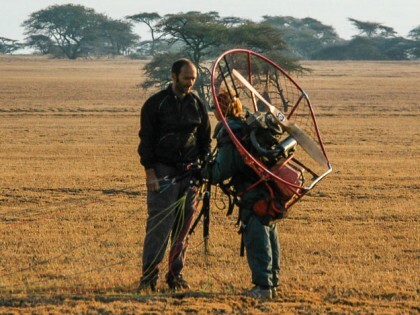 We will set up the paramotors, and all the equipment. First briefing will be given, while having a nice dinner together. 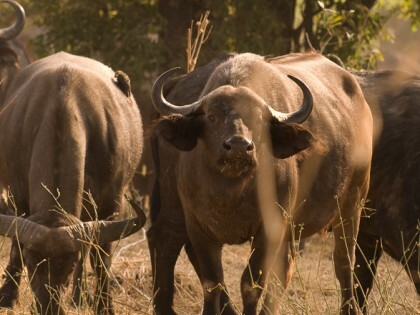 We will drive to the river, thru the bush for a 4 hours drive and reach the first place where we will stay on the shore. This area was once, before the war, a favourite hunting place for celebrities, and kings from all over the world. 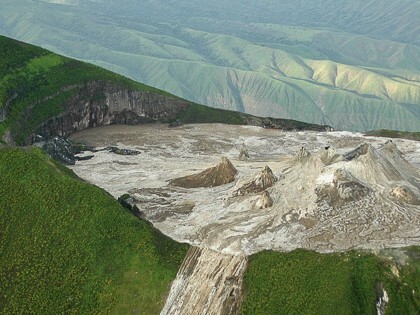 We will camp there, with hippos and crocs close by. 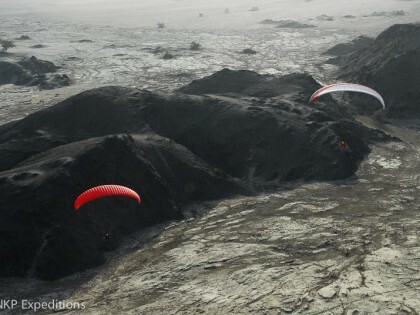 After a nice dinner, all paramotors will be prepared and we will do the first serious briefing. 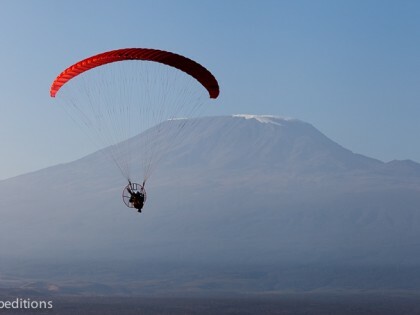 We will take off for a morning flight with our paramotors, around 6 am for 2 hours, exploring the river and spotting the wildlife. When landing, serious breakfast is waiting for us. We will start canoeing down the river, until the next camping spot, where eventually we will fly again, if the winds allow. Good camp in the bush and enjoy a good dinner. We will reach the Delta, and have to deal with tide to reach the ocean. The flights will be completely different with blue waters, and different wildlife. A bonus will be to find the dugong from the sky whales or whales sharks! We will set up the camps on the sandbanks of the river, and at the end, on the Indian Ocean beaches. Local fisherman will supply us with fantastic lobsters and fresh fish to put on the grill. 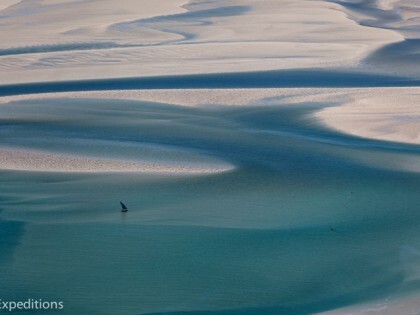 Arrival in Bazaruto Island to spend 3 days in an amazing lodge and we will fly over the fantastic sand dunes and blue waters, dive in the crystal clear ocean, or simply relax and enjoy the 5 star services of this exceptional place. After breakfast, return to Vilanculos International Airport, in a light aircraft and time to take the International return flight. Airfares and related fees, passport and visa expenses; baggage/accident/cancellation insurance; personal expenses, such as laundry, telephone calls, and other alcoholic beverages; gratuities and any other items not specifically noted as included.